Kazi had offered to help me out with something on Saraku (looking for an engineering recipe I believe) and on the way he stopped to see if the raid boss dragon in Duskwood was around. We tried to 2-man it, discovered that it uses a cheap sleeping cloud trick, and ended up running back to our bodies. 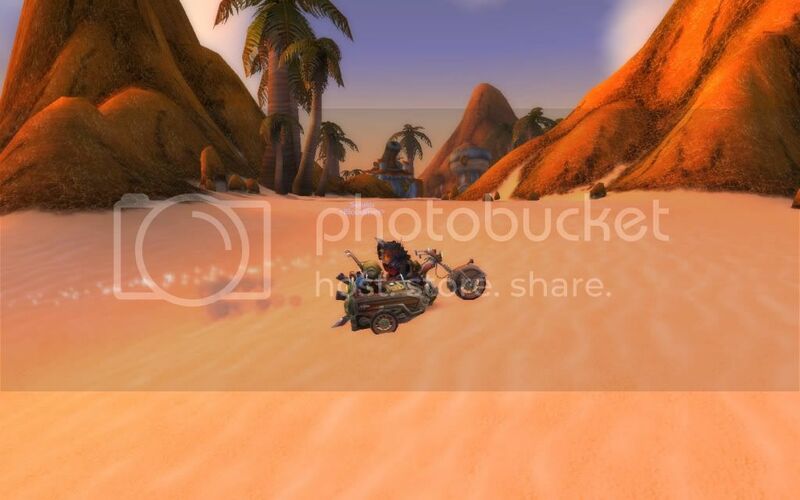 Then we rode around some more…well Kazi drove, I rode in the side car of his Mechano-hog. Then we started talking over vent about exploring and we discovered that Kazi had never been to the little tauren farm south of Silithus and neither of us had been to the Tanaris Islands. This called for a road trip! The Tanaris Islands are 2 islands that are only inhabited by a handful of Bloodsail pirates, a scorpion, and a buzzard. However there are a bunch of buildings and contraptions that are interesting. After studying the architecture we discovered that the north islands have gnomish buildings and the south island has goblin buildings. Between Wowwiki and our own thoughts, the place could be a testing ground for engineers, an old competition grounds, or what’s left of a battle between the two races. Either way, it was pretty neat. 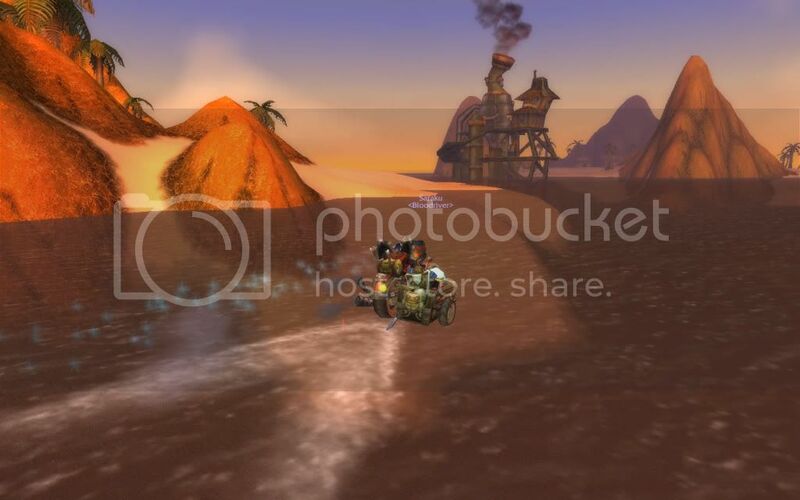 Then we headed over to the tauren farm, which is a good half hour ride over water (thank god for shammy water walking). There was a small detour as we explored the rather large cave that’s on the way there and Kazi claimed it for the Horde by planting an Orgrimmar banner in the ground. While admiring the tauren farm, we started talking again about exploring and I mentioned the dancing troll village that I had heard about between Felwood, Moonglade, Winterspring, and Darkshore. At this point, there was no chance we were going to pass us that challenge. We were off again to Winterspring while I found this video to guide us down the right path. There’s some LONG falls you have to take to get there so you pretty much need some way to slow fall or survive the drops. In our case, we both had engy parachutes and I had bubbles. Engineers FTW. 😉 Kazi used his nitro boosts and parachute right at the first big jump, and he sailed right over the village and almost over the mountains on the other side into Darkshore. Being more nervous about it, I took the jumps slowly and one at a time. Now at this part, I not only remembered to take screenshots but also remembered that Xfire has a built-in video capture. So I will let them speak for themselves. I like how I ended the video with us fishing in the boat. Horde Crates? What could this mean? 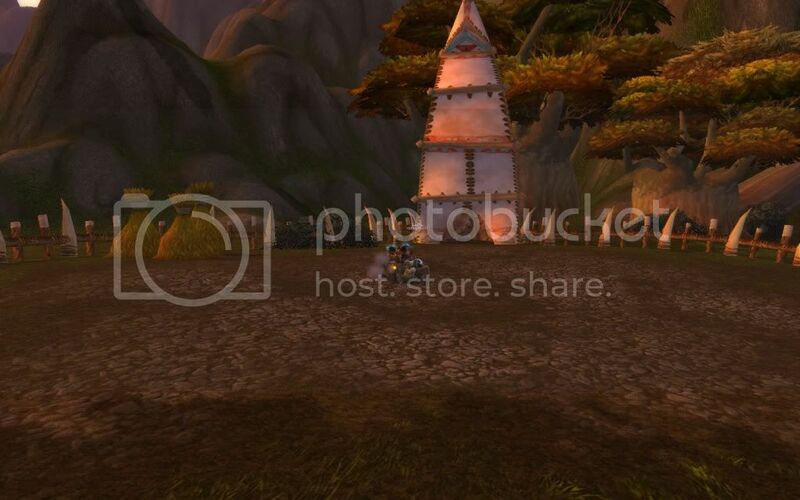 The Shatterspear village will become an accesible subzone of Darkshore in World of Warcraft: Cataclysm. 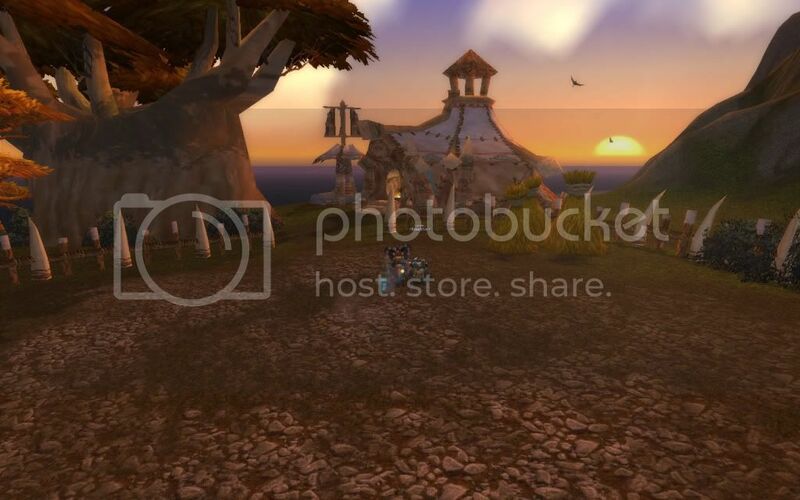 A screenshot of the village released via press kit shows an ancient nearby. Speculation has it, that these trolls are the next troll tribe to join the Horde (following the Darkspear and Revantusk tribes). The ancient standing in their village, the proximity to Moonglade, and the fact Trolls are going to be able to become Druids in Cataclysm, causes a suspicion that the Shatterspear Trolls are either becoming a “playable race” (Just saying that the Troll Druids are of the Shatterspear tribe) or that they taught the Trolls of the Darkspear Tribe how to become druids, as well. Next time on The Adventures of Kazimierz and Saraku, we explore the Tauren house in the mountains between Mulgore and the Barrens! Comments closed — Trackbacks closed RSS 2.0 feed for these comments This entry (permalink) was posted on Wednesday, October 14, 2009, at 3:24 pm by Faeldray. Filed in Exploration, Musings and tagged Kazimierz, Saraku. « What secret places do you know about? That was a great evening…nothing like finding little easter eggs hidden around the world like that. I didn’t have many, especially of the islands…there are a number of the gnomish buildings inland, including the odd two-story living quarters-type one that can also be found near Gadgetzan in Dun Morogh. Let’s try again, sans the failure, hmm? Yeah, you can note that as the exact moment I realized I was on film. Figured I had to do it at least once, right? I know. I just thought it’d be funny to bring up.